What kind of fish are these? We have a bunch in our little irrigation pond, so my wife and son caught some for fun. Re: What kind of fish? Can't really tell but could be what we call rain minnows. Tough to see on my phone, but looks like bluntnose minnows. Minnows.... good eatin' if you're a perch, pike or bass. Looking on my PC today, I'm not sure if it's a bluntnose now. It's something I always catch in the creeks here in Ohio, but I don't know the name. It may be a type of shiner. Edit: now that I zoomed in I can see it better. 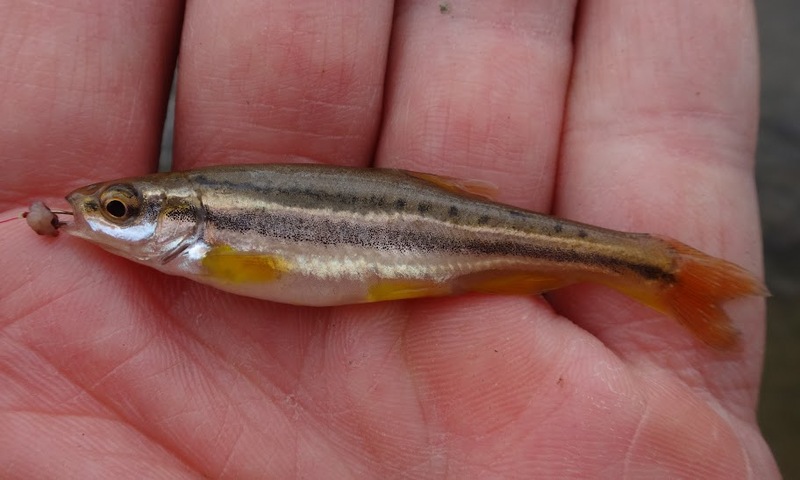 Pretty sure its a red belly dace. haase wrote: A tropical fish. Does look like some of those I used to have in my aquarium. DId you catch that on a hook????? M.Magis wrote: Looking on my PC today, I'm not sure if it's a bluntnose now. It's something I always catch in the creeks here in Ohio, but I don't know the name. It may be a type of shiner. Are you going to have it mounted? Looks like bait to me. Thanks guys I think they’re blunt nose minnows. micro fishing...it's a pretty new thing, tho most of us have played around with it at one time or another trying to catch some bait after we were out of minnows or crickets. I guess it's something I could get into a little more just for the challenge of it.